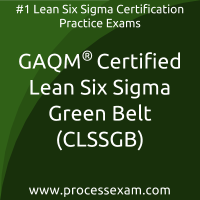 Are you looking to achieve GAQM Certification and become an GAQM Certified Lean Six Sigma professional? 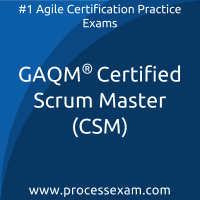 We have good news for you; we have a solution, which can help you clear the GAQM certification. We are here to assist you in achieving your goal by using our online certification practice exam platform. With tons of experience in the field of Process and Quality Improvement, our expert panel has designed these practice exams the same as real GAQM certification exams. 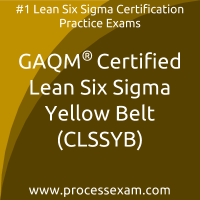 Our team of experts recommends you to use these online Lean Six Sigma certification practice exams for your GAQM CLSSBB or CLSSGB or CLSSYB Certification preparation. These practice exams will help you to validate your knowledge and identify the areas which need improvement, will make you familiar with GAQM certification exam environment, exam pattern and question format. Certified Lean Six Sigma Black Belt (CLSSBB) is well versed in the Lean Six Sigma Methodology who leads improvement projects, typically in a full-time role. A Certified Lean Six Sigma Black Belt holder possesses a thorough understanding of all aspects within the phases of D-M-A-I-C. They understand how to perform and interpret 6 Sigma black belt tools and how to use standard principles of Lean. The Certified Lean Six Sigma Black Belt is a professional who can explain Six Sigma philosophies and principles, including supporting systems and tools. A Black Belt should demonstrate team leadership, understand team dynamics and assign team member roles and responsibilities. Black Belts have a thorough understanding of all aspects of the DMAIC model in accordance with Six Sigma principles. They have basic knowledge of Lean enterprise concepts, are able to identify non-value-added elements and activities and are able to use specific tools. Certified Lean Six Sigma Green Belt (CLSSGB) exam comprises of Lean Six Sigma Methodology who both leads or supports improvement projects, typically as a part-time role. A Lean Six Sigma Green Belt possesses a thorough understanding of all aspects within the phases of D-M-A-I-C. They understand how to perform and interpret Six Sigma tools and how to use standard principles of Lean. The moment i faced any questions related to the Lean process improvement topic, i would go weak in my knees. However, i did not fear after i opted for the CLSSYB mock tests. They helped me understand all the concepts related to the topic and made me realize that understanding is all that is required to clear the Lean Six Sigma Yellow Belt certificate exam. GAQM CLSSBB mock tests are well designed. Along with practice tests, they have a strong back-up of review system which keeps on updating the questions to help give a real picture of what we can expect in the actual Lean Six Sigma Black Belt certification exam. 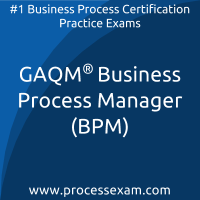 Just like in the actual BPM certificate exam, I got the same time to clear the Business Process Manager mock tests which helped me clear the exam in the provided time. 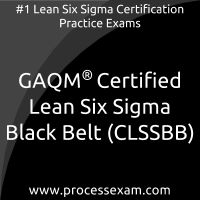 Clearing GAQM Lean Six Sigma Black Belt Certification exam is like a dream come true. The mock tests are extremely helpful and amazingly affordable. My target was 81% and i got that due to right practice at right time. I had 50+ BPM questions for practice in the simulated tests that helped me get good exposure and clear thinking.